Cool Facts About the Slurpee | DSL Inc.
Below you’ll find an article originally published by The Week with some cool facts about the history of the Slurpee program. This delicious frozen treat was created by accident. Realizing he had a surprise hit on his hands, Knedlik built a machine in the back room using the air conditioning unit from a car that would create slushy soda by combining and freezing a flavor mix, water, and carbon dioxide to make it fizz. But things really took off when, in 1965, 7-Eleven licensed the machine, but called the drink by a different name to make it unique for their stores. The name Slurpee was coined by Bob Stanford, a 7-Eleven ad agency director, when he described the sound made while sipping it through a straw. Thanks to inventive advertising aimed at the growing youth market, Slurpees were an instant hit with the Woodstock generation. The cups featured colorful, almost psychedelic designs, and the flavors — “Fulla Bulla,” “For Adults Only,” and “Kiss Me, You Fool” — were edgy for the time. 7-Eleven ads were so popular that radio DJs were getting call-in requests for Slurpee commercials. One 1970 campaign featured a full-length song, “Dance the Slurp,” written by one of the founding fathers of radio jingles, Tom Merriman. It was released on free, promotional 45 rpm records available in 7-Eleven stores. The catchy little tune was a huge hit at the time and its influence even extended into the late-1990s, when turntablists Cut Chemist and DJ Shadow used the song as the inspiration for their 1999 album, Brainfreeze. Because so few copies of the giveaway album still exist, copies of “Dance the Slurp” regularly go for as much as $50 on eBay. In the 1970s, 7-Eleven started selling special cups with images of sports stars, comic book characters, early video games, and even rock bands. The cups kept kids coming back to complete the entire collection. Later, limited edition Slurpee flavors started accompanying the cups to create a complete marketing package. This is a tradition that has continued today through promotional tie-ins with video games, professional wrestling, and extreme sports. In recent years, Slurpees have come in annual summer movie cups and flavors. Dating back to 2002, when the tie-in for Men In Black II was a blackberry drink, the promo cups and flavors have grown more and more elaborate (and popular). The biggest hit so far has been the Iron Man franchise, with special collector’s cups that feature 3-D character designs and a special helmet dome lid. They’ve been sold on eBay for three times what they originally sold for in the store. However, for The Simpson’s Movie in 2007, they went beyond just redesigned cups and wacky flavors. Select 7-Elevens were converted to look inside and out like Kwik-E-Marts, the 7-Eleven parody on the show, complete with “Squishees,” the cartoon world’s version of the Slurpee. The tie-in flavor that summer was Woo-Hoo Vanilla Blue, probably one of Homer’s favorites. You’d think the last thing Canadians would want is a frozen drink. But every year since 1999, Winnipeg, Manitoba, has been crowned the Slurpee Capital of the World. Detroit sells the most cups of any U.S. metro area, but the largest single Slurpee-selling store in the U.S. is the one in Kennewick, Wash., which locals have dubbed “The Slurpee Factory.” Overall, North Americans sip almost 13 million Slurpee drinks every month. And since 1966, close to 6.5 billion Slurpee drinks have been sold, enough to almost fulfill your dreams of buying the world a (frozen) Coke. Every year since 2002, on July 11 (that’s 7/11, of course), the company celebrates its birthday with “7-Eleven Day.” Only in this case, the customers get the present — free 7.11-ounce Slurpees for the first 1,000 people through the door of participating stores. It’s estimated that the company gives away over 5,000,000 Slurpees to happy customers on this one day. As any regular Slurpee fan knows, one of the best parts about the self-serve drink is being able to mix flavors from different dispensers. According to Slurpee market research, 41 percent of slurpers never mix their flavors, 37 percent always do, and 21 percent will mix every once in a while. The most popular combinations use the Coke flavor as a base, with a fruity mix on top — often Wild Cherry or Piña Colada. But of course for the really daring, there’s always the “Suicide Slurpee” — mixing a little bit of every flavor from the row of dispensers. Some of the wilder Slurpee flavors on tap have been Grapermelon, Darth Dew (a tie-in with Star Wars), Bubble Yum, Banana Cream Pie, Mango Bango, Red Licorice, Purple S-Cream, Slurpurita Pomegranate, and Shrekalicious (a tie-in with Shrek). Most of these and other wild and wacky flavors sound like they could come from a factory run by a guy named Wonka. But in fact, most are the invention of the mad scientists at the Dr Pepper Snapple Labs in Plano, Texas. (Yes, they make Snapple and Dr Pepper flavors, too). 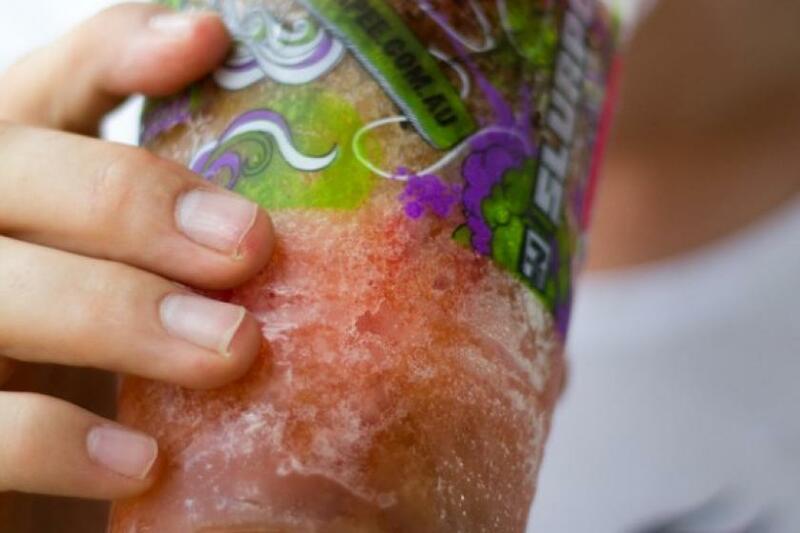 To create a new Slurpee flavor requires a savvy combination of science, senses, and marketing. One of their biggest challenges is keeping up on flavor trends, such as knowing that exotic fruits like acai, yumberry, litchi, and dragon fruit are becoming popular with consumers; whereas previously hot flavors, like mango and pomegranate, are now commonplace. Of course just because it’s popular doesn’t necessarily mean it will taste good. They go through numerous rounds of product testing until they get the flavor just right. But once they’ve locked down the taste, they have to consider the name, the color, and the consistency of the mix when it’s cooled to the standard 28 degrees Fahrenheit. The process can take weeks or even months to go from concept to your corner store. In 2010, 7-Eleven launched a massive promotional campaign in the form of the Slurpee Unity Tour, a cross-country trek from 7-Eleven’s Dallas headquarters to the nation’s capital, giving away free samples of their new purple drink (a mixture of red and blue, ala Republicans and Democrats) to Slurpee fans along the way. That wasn’t the first time 7-Eleven went political. Since the 2000 presidential election, the company has run a promotion called “7-Election,” where customers vote by purchasing special red or blue coffee cups printed with each candidate’s name. The cups are scanned at check-out and automatically entered in this unscientific, but surprisingly accurate poll — in 2000 and 2004, the number of coffee cup votes and the number of actual popular votes for both candidates was only off by 1 or 2 percentage points. While 2008’s 7-Elections results were still correct, they gave the election to Obama by a landslide — 60 percent to 40 percent — when the margin was really only about 7 percent. In 2012, Obama won the 7-Election by a similar margin.